Our southern Idaho archery antelope hunt is quickly becoming one of my favorite hunts of the year. If you do the work in the weeks prior to season, harvesting a mature buck is relatively easy. That’s not to say that it’s a give-me hunt because it definitely is not. About two to three weeks prior to season my husband Ty and I scouted the desert where we’d been seeing several groups. We found two waterholes that had a lot of tracks around them. Ten days prior to the beginning of the hunt Idaho Fish and Game allows you to set up a ground blind. Once we got the blinds set up, we periodically checked back in to make sure our blinds were still standing and we still had water in the hole. By the time season arrived one waterhole had shrank to about a third of the size it was when we first set up our blind, but it also continued to have the most tracks around it. Opening morning I cruised out to that blind on my four-wheeler and my husband took off to the other blind. The first light of day was just peeking over the horizon when I climbed inside. I was just getting set up when the first antelope appeared on a nearby hillside. As quickly and quietly as possible I got my bow out of the case and put on my release. Despite making a ton of noise and fighting with a little shrew that seemed intent on eating my lunch, the doe came right in. For the next three hours it was an endless flow of antelope. Some came in groups of four or five, but most of them were singles. A big beautiful buck came in by himself, but something about the water hole just wasn’t sitting right with him. He came in to about 50 yards, circled the blind at a wide berth several times before he set off over the hillside. It wasn’t long after that a small buck and two does showed up. At this point, I had been noticing the little bucks seemed to be heavy in the rut, much more so than some of the larger ones. They’d been on the hole for five minutes or so when a beautiful big buck appeared on the hillside directly in front of the blind. The other three must of been a confidence booster because he came straight in without hesitation. It was fourteen and a half yards to the other side of the water hole. I was drawing my bow when all of sudden the arrow shot out of the top of the blind and landed about half way between me and the speed goat. Believe it or not it didn’t even phase him! I think some how I hadn’t fully attached my release, so when I went to draw it back it slipped off. Right about then the little buck noticed his does getting too close to the big buck and decided it was time to take action, running the big buck off the hole and behind the blind. I was busy regaining composure and nocking another arrow when the big buck came back in. This time he was standing right next to the blind about three yards away. Awkwardly I went to full draw and had to lean back and to the left just to get a clear shot. 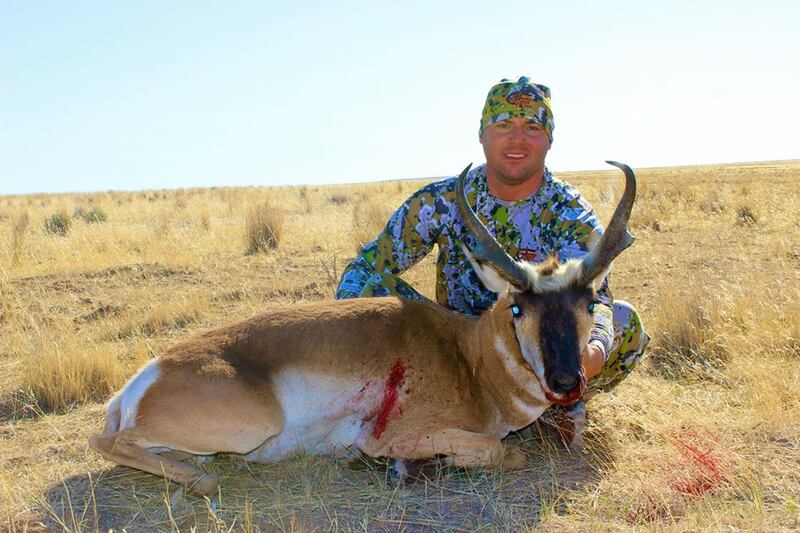 I put the 20 yard pin on that spot on the antelope where white meets tan and released. A clean shot through and out the other side. The buck ran about forty yards and fell over. 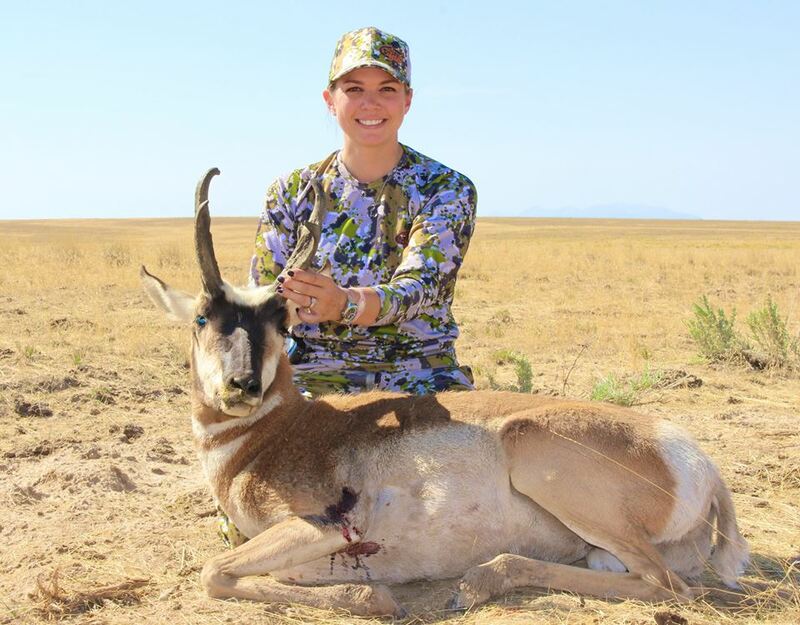 A little over three hours into my antelope season I notched my tag. The following morning, right around the same time, on the same waterhole, my husband tagged out with a beautiful buck as well. This hunt marked a milestone for me. It was the first time I ever fully hunted alone. I wasn’t too sure how I would feel about it when my husband first suggested it, but I have to say I thoroughly enjoyed it. Setting out on your own, to take on whatever challenges come your way in the field, is incredibly liberating. It wasn’t too long ago that walking to a blind in the dark would have been met with an “absolutely not!” I foresee more solo hunts in the future.